Beautiful certificate from the Falls City Insurance Company issued in 1890. 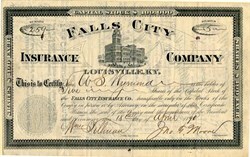 This historic document was printed by Louisville Lithographer and has an ornate border around it with a vignette of the Falls City Insurance Company. This item has the signatures of the Company's President, John T. Moore and Secretary, William Tillman and is over 116 years old. Kentucky: A History of the State, Perrin, Battle, Kniffin, 8th ed., 1888, Jefferson Co.
JOHN T. MOORE, banker, is a native of Jefferson County, and was born March 7, 1827. His parents, Thomas D. and Margaret (Frederick) Moore, were natives of Delaware, and came early to Kentucky. The former was a prominent merchant of Jeffersontown, Ky., and died in 1831, when subject was but four years old. Margaret (Frederick) Moore was a daughter of August Frederick, and an early resident of Jefferson County. Upon the death of his father the subject of this sketch was taken and educated by Gov. Willard, of Indiana. After completing his education he became a clerk in a clothing store for one year, and afterward in a fancy dry goods store of J. Raphael, where he remained for four years. In 1849, when the gold fever broke out in California, he crossed the plains to the gold regions, where he was successful in accumulating wealth, but later he lost heavily by a fire that took place in Sacramento. He returned to Louisville in 1855, and engaged in the wholesale grocery business, and is of the firm of Moore, Bremaker & Co., having remained without the change of a member of the firm or location of the house of twenty-six years. In 1882 he was elected president of the Falls City Bank, of which he had been for several years a director and vice-president. The bank is one of the substantial institutions of the city, and was organized in 1865, with L. L. Warren as president. Mr. Moore has been president of the Falls City Fire Insurance Company since 1884, the year it was organized; he is a stockholder in the Bremaker, Moore Paper Company, is a director in the Louisville Safety Vault Co., a director in the Union Warehouse Co., and is prominently connected with other business enterprises of the city. He was married in June, 1856, to Miss Emma Applegate, a daughter of Elisha Applegate, one of the first tobacco inspectors of Louisville, who was born in Fort Nelson, and lived to be ninety-two years old. Mr. and Mrs. Moore have five children, viz: Robert B., Patti M., Emma Belle, John T. Jr., and Margaret.